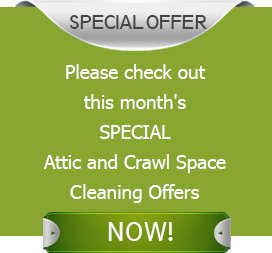 For most homes, the attic and crawl space is a dark and disheveled storage area to dump all the junk! These frequently forgotten places are prone to serious damage from unwanted intruders and problematic infestations which can have a negative impact on your home, family and budget. Regularly scheduled inspections are vital as it helps spot signs of trouble and address them timely. This ensures the safety, comfort and energy efficiency of the property down the line. Whatever the problem we at Quartz Solutions have the expertise and equipment to get rid of it. Our team, armed with the latest techniques will provide customized remedial measures for the maintenance and upkeep of your attic and crawl spaces. Overlooked attic and crawl spaces provide the perfect hideout for a range of potential hazards to take root there. If ignored the smaller issues turn into major ones, a situation that can have homeowners footing the bill for some very expensive home repairs. Moist and humid environment can lead to huge mold and mildew build-up. This not only deteriorates insulation but triggers wood decay and allergens which can impact the health of the inmates. 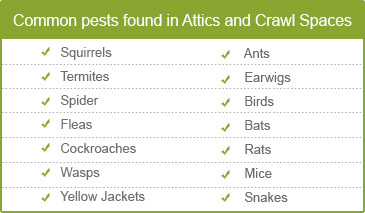 Unclean attics and crawl spaces are the favorite haunts of rats, possums, squirrels and raccoons. This menace destroys electrical systems, gnaw through insulation, furnishings and pollute the home with diseases. Drippy ducts, poor ventilation and faulty insulation translate into high utility bills in the summer and winter. Wasps, fleas, cockroaches and spiders are carriers of germs that kick up infections. Termites and carpenter ants eat into the wooden beams and weaken the very foundations of your property. An in-depth walk through of the property by a professional company like Quartz Solutions can go a long way in safeguarding the well-being of your family and investment. Our skilled team that specializes in detecting attic and crawl space issues will visit your home or office for a scheduled evaluation of the property without charging a cent. Once they have tracked the existing issues and extent of the damage, the experts will chalk out a pocket-friendly remediation plan. We at Quartz Solutions strive to provide high-quality service at pocket-friendly rates with no hidden charges. Customer satisfaction is our top priority. Springfield is a city of 17,000 located in Union County NJ. Though not a major tourist destination, Springfield is a beautiful suburban setting that provides its residents a serene, safe and extremely clean environment. Quartz Solutions would love to help maintain the sanitation of the city. Hire us to keep the attics and crawl spaces of Springfield in tip top shape. Contact us today at 973-536-1013 to avail your free inspection and consultation! Josh and his crew were very professional and did an excellent job cleaning my attic. The space is now fresh, clean and tidy. Well done!